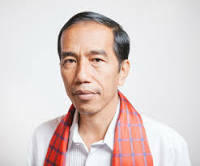 Muslimedianews.com ~ President Joko “Jokowi” Widodo wants members of the executive board of Nahdlatul Ulama (NU), the country’s largest Muslim organization, to continue contributing ideas on how to solve the country’s myriad problems. The chairman of NU’s board of advisors said the organization was ready to contribute on efforts to eradicate radicalism. “We are ready to cooperate with the government to deal with radical ideologies and radicalism being promoted by various groups,” Indonesian Ulema Council (MUI) chairman Ma’ruf Amin said after a meeting with Jokowi at the State Palace in Jakarta on Thursday. NU executive chairman Said Aqil Siradj, who also joined the meeting, said Jokowi wanted leaders of NU to help boost optimism in the face of global challenges today.“I was asked to calm down members of NU who were concerned over the current economic slowdown, to explain that the country’s present condition is related to the global economic slowdown, and also to maintain their optimism, so that they would not lose hope,” he said as quoted by Antara news agency.